One of the most important aspects of delivering excellent customer service is accessibility. When customers have a problem they need solved, it's your business's responsibility to provide adequate channels for them to reach out to you. Phone channels are a traditional way of providing immediate customer service. Most companies will setup or adopt a call center to field customer service requests and complaints. These call centers organize phone support queues and equally distribute calls to reps on the service team. While call centers are a common feature of most customer service teams, setting up one for your business is no easy task. This post will break down the different components that make up a call center as well as how your team can develop an inbound call strategy. Inbound calls are phone calls made to a company's customer service or support team and are initiated by the customer. These calls are typically fielded by the organization's call center or help desk which then handles the consumer's complaint or request. Responding to inbound calls is a primary function of most customer service teams that are looking to enhance the customer experience. Inbound calls are a fundamental aspect of customer service and support call centers. Most companies provide a phone number that customers can reach out to when they have complaints or requests. These organizations own either an in-house call center or a remote one that takes the call. Some companies even have remote call centers where employees work from the comfort of their home. This makes it easier for customer service teams to provide 24-hour support since they have employees working in different time zones. Call centers will also utilize call center tools that assist with the distribution of inbound calls. Depending on the industry, call systems can screen incoming calls and analyze the customer's request. Then the software transfers the call to the rep who's best suited to resolve the issue. This can significantly increase a call center's productivity while simultaneously improving the customer's experience. Once the inbound call is connected, the rep will try to resolve the issue during the first interaction. If that's not possible, the rep can follow up with the customer via email, or if needed, over the phone again. In these cases, the rep can set the expectation for communication moving forward and continues to work on the case until it's resolved. Most customer service reps field inbound calls every day, but this isn't the only type of call that a representative will take. Many customer service teams will offer both inbound and outbound calling options for their call centers. Inbound and outbound calling are two essential functions performed by most customer service and support teams. While inbound calling is initiated by the customer, outbound calling occurs when the company's representative calls the customer first. This acts as a measure of proactive support that makes it easier for customers to connect with customer service teams. Customer service teams offer outbound calling as a means to improve their availability to their customers. If customers are in need of service or support, they can schedule a time to speak with a rep to discuss the issue. The customer will describe the issue prior to the call giving the rep some time to come up with a solution before calling. This not only makes it easier for customers to connect with customer service, it also prevents them from being placed on lengthy holds. Customers can submit their issue ahead of time and continue their work day as your customer service team investigates the issue separately. A call center's inbound call volume can vary significantly depending on the business and the industry. Some inbound call centers experience significantly high volumes of calls and are constantly active throughout the entire day. To get an idea of how many calls your agents should be taking each day, your team will need to take an in-depth look at your daily call center metrics. How Many Calls Should an Inbound Agent Take? It can be difficult to estimate how many calls that you should expect from your customer service team members. This is because inbound calls are a reactive function that's easily influenced by a variety of internal and external factors. For example, when GDPR legislation came into effect, the HubSpot support team saw a sudden influx in calls regarding that specific issue. This forced HubSpot's customer service managers to create a game plan that prepared reps for handling GDPR questions and problems. While unexpected roadblocks like these make it difficult to calculate the exact number of calls a rep should take, you can use some call center metrics to determine a rough estimate for this value. Start by looking at your entire call center's monthly call volume. Then divide that number by your total number of reps to see how many calls that each rep averages in a month. You can then divide that number by the days in the month to obtain the daily average for calls taken by each rep. So for example, let's say my company records a total of 10K calls for the month of January and I have 25 agents in my call center. That would mean that each agent is averaging about 400 calls each month (10,000/25 = 400). If I divide that value by the number of days in January, I can see that my agents are averaging about 13 calls each day (400/31 = 12.9). I can then use this number as a baseline for determining the call quota for my customer service reps.
Now that you can calculate the daily number of calls your reps should be taking, it's time to fire up your phone lines and start taking calls, right? Not quite. There are still a few more steps you'll need to take before your call center will be fully operational. Let's review what you'll need to do to start a call center in the next section. Create a call center strategy. Determine the number of reps you'll need and hire them. Invest in call center equipment. Analyze and re-evaluate your call center metrics. 1. Create a call center strategy. 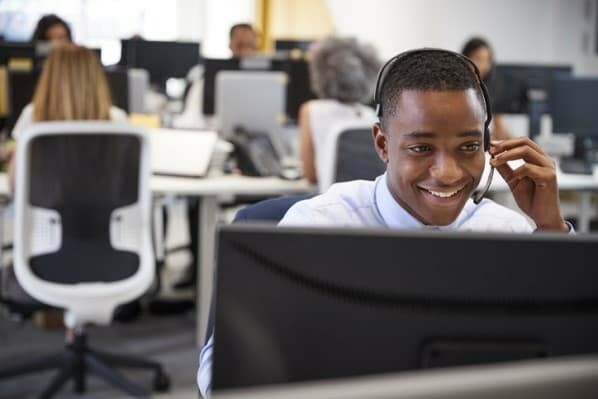 Before you start hiring agents to work in your call center, you'll want to first determine a strategy for how you'll implement this new customer service channel. The first question that you'll have to answer is whether your call center will be providing technical support, or proactive customer service, or both. 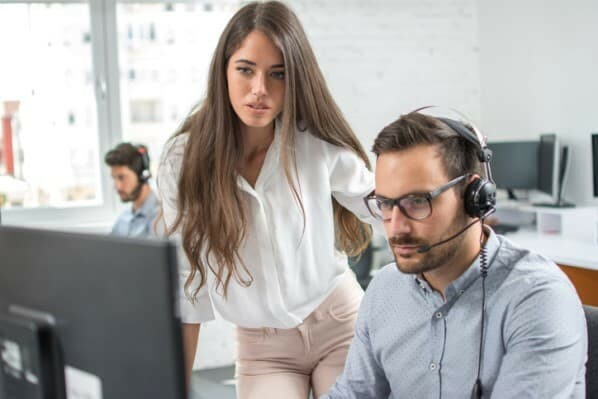 In other posts, we've discussed the difference between customer service and support, and those differences come into play when setting up a call center. 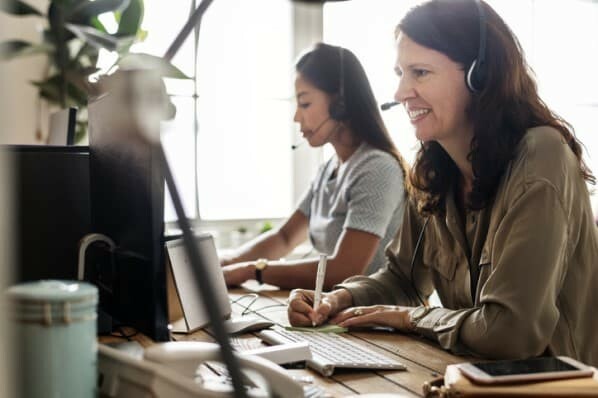 If your company is focused on providing reactive support to inbound calls, then you'll want to focus on creating a customer support call center. 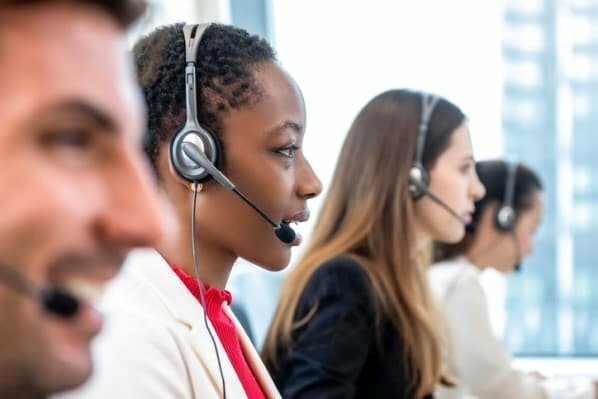 If you're looking to promote products and drive long-term solutions geared towards customer success, then you'll lean towards building a customer service call center. In many cases, businesses train reps to handle both functions, cutting costs for the company while expanding its customer service bandwidth. The next step in designing your call center strategy is determining the type of calls your agents will take. Customer support call centers will probably field more inbound calls while customer success centers will make outbound ones. Again, companies will often have reps perform both depending on the customer's needs and the resources that business has available at the time. Lastly, you'll want to consider how your call center will grow as your business expands. As you obtain more customers, you'll need to develop a plan for handling a higher volume of calls. You'll also want to prepare your approach for dealing with crises that could potentially affect the business. Considering these types of factors ahead of time can help your call center handle future roadblocks and keep it stable over time. 2. Determine the number of reps you'll need and hire them. Labor costs are never cheap, and when starting a new call center, it can sometimes be tough to determine the perfect number of people to hire. To prevent hiring too many or too little reps, you'll want to estimate how many calls you can expect for your company in a given month. Look at your product usage reports and obtain customer feedback to get a better idea of how often your customers interact with your business. It can help to start by providing an email support channel to gauge customer engagement over a less complicated medium. Also, if possible, you could survey and analyze competitors to see how many agents are typically hired by companies in your industry. After you have your estimate, it's time to hire your phone team. When hiring, it's important to look for charismatic people are energetic and welcoming. The best phone reps have strong emotional intelligence and can manage difficult or stressful customer interactions. Seek out strong communicators who are patient and have a knack for problem-solving. Great customer service begins with the employees who provide it, so it's important to invest in your hiring process when bringing on new team members. 3. Invest in call center equipment. If you want your call center to be effective, you'll need to adopt a call center system to help your team field and distribute calls. Companies like Avaya, Twilio, and Nextiva sell communication software that can process calls and deliver them to your reps. This software can be upgraded and expanded as the company grows over time. Along with the call system, you'll need to invest in the proper hardware that your team will operate with. This includes necessities like call-center headsets, computers, monitors, and keyboards which reps will use every day. It also helps to have additional software like help desk tools that provide various support features. For example, calling tools can help your team track and record calls, and a CRM can pull up useful customer information that helps reps improve the customer experience. While these tools may appear costly at a glance, adding them over time can help your call center grow at the same pace as your company. 4. Promote your call center. Now that you're prepared to launch your new call center, it's important that you share this exciting news with your customers. Partner with your marketing and sales teams to promote your new customer service channel to your customers. If you're already providing another support channel like email or live chat, be sure to brag to your customers about your omni-channel service experience. This makes you much more accessible to your customers and demonstrates a dedication to customer success. One way to promote your new channel is to offer it as a beta feature to premium users. At HubSpot, when we rolled out our new chat support channel we first offered it to a select number of users. Then, over time we slowly ungated it until it was available to all users. This helped us not only spread the word about this new feature, but it also let us test and tweak our chat support system before it was officially unveiled to the public. 5. Analyze and re-evaluate your call center metrics. Once your call center is officially up-and-running the last step is to analyze your call metrics. Key performance indicators (KPI) will vary for every call center depending on their target audience and their customers' needs. In general, look at KPI's like average talk time, abandon rate, and call volume to determine whether your call center is properly equipped to provide long-term service and support. Make sure the daily goals and quotas that you're assigning to your team are attainable and are being fulfilled. If you notice that your team is struggling in one area, you may need to re-evaluate your KPI's to better align with your customers' needs. By constantly reassessing your call center's performance, your phone team will stay up-to-date on the most current customer needs and create a more enjoyable service experience. These fundamentals should help any business construct an effective call center for its customer service and support teams. However, while these steps can help you develop a team to take calls, they don't provide much insight into how you can effectively resolve inbound calls. Resolving inbound calls during the first interaction can be a valuable asset for your company. In fact, studies show that 67% of customer churn is avoidable if the issue is resolved after the first interaction with the company. Preparing an inbound call strategy is a great way for your team to develop an effective approach to inbound calls that consistently results in a positive interaction. These four tips will help ensure you're getting the most out of your inbound call channel. 1) Reserve the voice channel for those who need it most. There's no better way to get to know your customers than by speaking to them directly. The challenge, though, is that every phone call costs a company between $9 and $15 on average, after taking into account the cost of labor. When doing business, some people prefer to call companies, others like to use live chat, and still others prefer email. Whether you have a state-of-the-art call center or not, tailor your communication channels to the different stages of the customer lifecycle to make sure your customer service team is talking to valuable customers. Think critically about when calling would be best for customers -- and profitable for you -- so that you can optimize the phone and drive all voice interactions to your benefit. Typically, the more consideration the purchase of a product requires (either because it's complicated or important), the more the voice channel will be important. Conversely, the simpler the task or decision, the more customers will want to self-serve. Maintain a toll-free number so clients can always call you, but be strategic about where you place it. Putting the number at the top of your homepage widens the funnel of incoming calls and lowers their value, especially for mid-sized companies. Consider putting the number at the bottom of your product or pricing pages, or right below your calls-to-action. 2) Follow through with your promise to be available. Once you've ensured that you're only getting the most profitable kinds of phone calls, the next step is to guarantee there's someone qualified on your end to pick up. Don't let the call go to voicemail or to an administrative assistant; the person answering needs to immediately be the right one. Consider using a cloud-hosted communications system like Voxox for routing the calls to the right people, based on the customer's interest or profile. Additionally, you might want to consider establishing an on-call system for your company, especially if you have a small enough team that it's reasonable for one team member to handle a shift alone. Everyone who answers the phone should make each customer feel like the most important customer in the world. You can do this no matter the size of your company: The success of companies such as Zappos or American Express for instance, has largely been attributed to the quality of their inbound voice channel and the attention they give to every call. While replicating this requires considerable resources, remember that Zappos and American Express were small companies at some point, too. 3) Track and analyze your inbound calls. Consider providing different numbers for your business to track the performance of your call channel. Use call analytics services from vendors like Ifbyphone, Invoca, and Century Interactive, which helps you categorize incoming calls based on their interest and quality. You can provide one number for Yelp listings versus one for Yellow Pages or another for Zagat. From here, you'll be able to track the success of your advertising expenses while still being able to respond to individual customers. Personalize the numbers you put on your business cards and in your email signature so that you're giving specific numbers to various categories of potential clients. You might even consider segmenting your inbound call channel based on service levels. For example, you can assign Gold, Silver, and Bronze categories to your clientele. If a Gold-level client calls, pick up no matter the time or inconvenience. If Silver, designate extended hours that you'll make sure the call goes through. If Bronze, ensure that you'll be able to pick up the phone when you're free, etc. Any type of stratification like those mentioned above helps you track the performance of your telephone numbers, improve your advertising spend, and provide better customer service. Taking these measures will not only help you maximize your marketing dollars, but it will also help you improve retention and customer loyalty. 4) Make your customer data work for you. Getting calls is great, but knowing what to do once you have them is even better. Studies show that employees are 15% more productive if they have access to CRM data while on a call. Having access to all of this accumulated and recorded information on-the-go can make a huge difference in the performance of your inbound call channel, especially when routing calls to field or technical personnel. Be sure that no matter when or where you receive a call you are able to utilize your CRM data. Couple your CRM data with social information to personalize it so that, if you get a call from an existing lead or prospect, you can cater the way you engage callers based on contract values, close dates, or social media updates from Facebook and Twitter. Look into integrating your CRM with your phone system using Computer Telephony Integration (CTI) adaptors such as AMC or big data solutions such as Klink. This ensures that the call is logged once the conversation is over and that the salesperson is prompted to update the record. Not only does this improve the performance of your inbound efforts, it significantly reduces average handle times and increases customer satisfaction. With smartphones becoming much more than a calling device, and consumers looking for digital, one-to-one experiences, it's easy to forget how important the voice channel is for growing your business. Embrace and enforce an inbound call strategy to get an edge over your competitors who rely on self-service and automation. Don't be afraid to advertise your telephone number, either -- it can only be beneficial to your business, just as long as you put it in the right spot! To learn more about creating a call center, read about what you can expect when working in a call center next.